Jim Correll is the director at Fab Lab ICC at Independence Community College. He can be reached at (620) 252-5349 or by email at jcorrell@indycc.edu. This is the eighteenth episode of Six Table Stories. “Six Table Stories” are completely mythical, and all involve the people in a completely mythical small community known as Six Table. All the stories were written by James D. Fischer. Some of the stories began as short plays, some have been wrestled into reading shape from short stories. A few have been published, in small anthologies. The players are a gracious volunteer outfit, the site you’re listening to is put up by the Independence, Kansas Public Library, which continues to be an adventurous outfit whose adventures have been nationally recognized. Interview conducted by James D. Fischer with Robert Augustus Wesley, community leader. Topic of this interview was "Growing Up Black in Independence, Kansas." Interview took place on February 16, 2018 at the Independence Public Library. 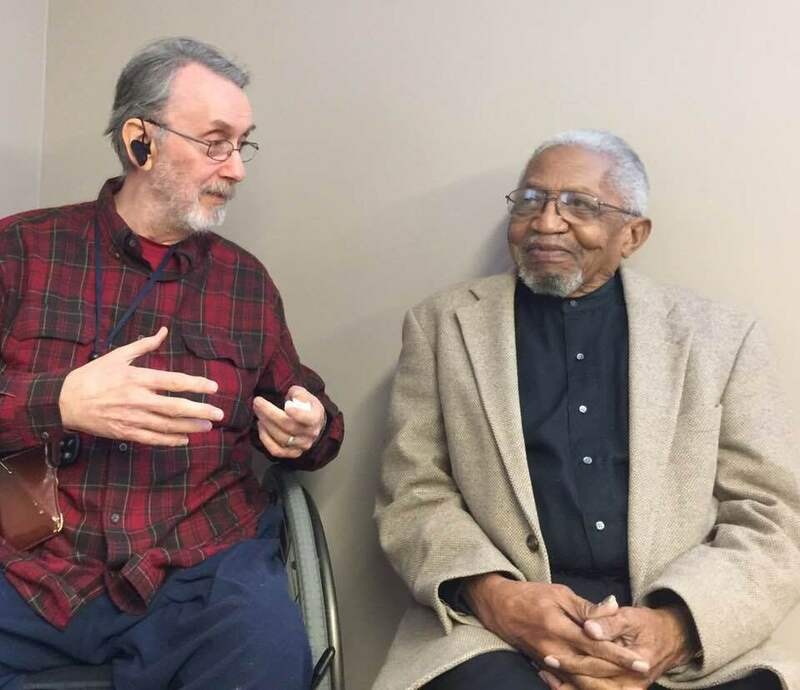 Here is a picture of James D. Fischer and Robert Wesley, chatting on the day of the interview. This is the seventeenth episode of Six Table Stories. “Six Table Stories” are completely mythical, and all involve the people in a completely mythical small community known as Six Table. All the stories were written by James D. Fischer. Some of the stories began as short plays, some have been wrestled into reading shape from short stories. A few have been published, in small anthologies. The players are a gracious volunteer outfit, the site you’re listening to is put up by the Independence, Kansas Public Library, which continues to be an adventurous outfit whose adventures have been nationally recognized. Daniel Ashford is a new artist at the Eclectix Art Gallery, 311 N. Penn Ave, Independence, KS 67301, (620) 779-9048. Here is a link to their website where you can find out more about Daniel Ashford and view some of his works. Jim Correll just may have figured out the biggest secret to business success, and it didn’t require an advanced business degree to do it. Instead, it’s been a matter of following his instincts, sponging up knowledge from thought leaders, making mistakes and pursuing passions in a wildly diverse 25-year career working in small business, manufacturing, entrepreneurial ventures and post-secondary education. What has he learned? When your mind is open to possibility rather than pessimism, amazing things can happen. Such are the lessons of entrepreneurship, says Jim. There’s no script, precise formula or lesson plan. Success requires a willingness to try something unconventional and to redefine failure as learning. It’s all about the mindset, and anyone can achieve it. Jim regularly shares his insights through multiple channels, including regional and national public speaking engagements, local print columns and radio features, classes at the community college, weekly community roundtable discussions and one-on-one consultation. His goal is to build a growing circle of “entrepreneurial thinkers" with a limitless ripple effect. Jim has served on boards and committees for several local and state economic development and business organizations (highlights below), and his most recent work as the director of the Fab Lab maker space in Independence, Kansas, has garnered multiple accolades. In May 2017, he was named among the “50 Kansans You Should Know” by Ingram’s magazine.